Johann Peter Salomon, the celebrated violinist and impresario, made his debut in England in March 1781. History has credited Salomon with bringing Haydn to London, yet as Ian Woodfield reveals in this monograph, Salomon's introduction of the composer to the London musical scene owed as much to luck as to skilful planning. Haydn's engagement in London proved to be a much-needed uplift to Salomon's career which, as Woodfield illustrates, had been on the wane for a number of years. 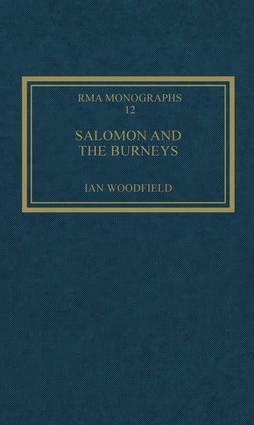 In addition to its reassessment of Salomon's uneven career in London during the 1780s, this book throws light on the general relationship between public and private spheres of professional music-making at the time, and on the relationship between the social and professional attributes required of musicians if they were to be successful. Nowhere are these tensions better illustrated than in the letters and journals of the Burney family, especially those of Susan Burney, which are drawn on in the book to provide a vivid picture of the fiercely competitive musical world of eighteenth-century London.